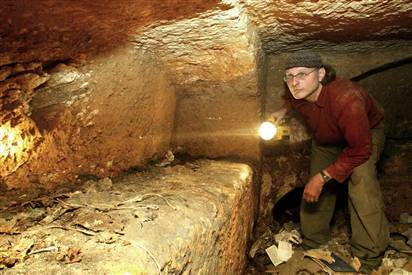 "The Lost Tomb of Christ,"
family, according to a press release issued by the Discovery Channel. So after seeing it on TV, it kinda got me thinkin. Of course I have a very deep faith and strong conviction in the life, death and resurrection of Jesus Christ. I guess I have to admit (and some my call this ignorant) that you could not convince me otherwise. I’ve seen science mess up too many times before. The Bible is clear about what happened and those documents have been proven time and time again throughout the ages. God has manifested himself and revealed himself to me in too many way throughout my life. However, it did get me thinking for a moment. Let’s say that they somehow provided "undeniable" proof that this really was the body of Jesus? What if they could "prove" that Jesus had not ascended into heaven? For those of you who are Christ followers, what would that do to your faith? What would it do to mine? Would I be shaken at all? Would I doubt? Would I stand firm? Would it make a difference? It got me on some really good thoughts. What about you? What do you think? Buy ambien 12.5 mgm overnight mail md consultation. Buy ambien cr no rx. Ambien compare prices buy patent. Buy ambien cr. Buy ambien. Buy ambien without prescription. I agree. Nothing the scientists can dig up will make me doubt that Jesus is the Son of God, that he was crucified for our sin, and that he rose again. All these media stories do is separate the lukewarm christians from the rest of us, which God will do in the end anyway. The Bible is the truth, and will outlast any fad, any other religion, any false idol, any scientist, any media frenzy, and Britney’s hair. I agree…there was many people names “Jesus” in that day and age…hard for us to fatham as it is “the name above all names”. I’ve always had a hard time with that, but it is true. We’ll pray that what Satan intends for evil, God will use for good in stirring up a hunger for what is real and truth. Let’s be ready. Massive Truth gave a link yesterday nteresting in regard to faith and science and how they mix…interesting to read! 2 Bobby’s with 2 babies lead 2 different revolutions…holy crap! Let’s have a dialogue on Britney’s hair or lack of hair. Here is another opportunity for America to prove that it has an attention deficit disorder. We tend to place attention on one issue for a while then the hype wears off and we go to another one. Remember the Jesus Seminar? At one time that was hot news, now it is nothing more that a blip on the religious radar. For a while it was the Da Vinci Code. I couldn’t belief all of the Christian studies and DVD’s that were a response to the Da Vinci Code. That hype came and went with the movie. Our DVD’s are worthless now because something new has arrived. Now it is this new one about the bones of Jesus. Well I have a bone to pick with the Discovery Channel! just kidding. This too shall pass. Maybe the next extreme story will be that God is really a woman. Just a thought! Sorry don’t have the long energy for the post, but want to say two things. 1. I don’t know how common Jesus was of a name in those times, but Jesus is used quite a lot among some cultures as a name. So It could be another Hesus. 2. To think that there was no God. As i reminiss about my life, i can thankfully say i hever never known a time where i didn’t believe that God existed. I grew up in the church. I think of some people that believe in the stars, or that they are there own God. Kind of scares me to think of what it would be like to feel that there is no God that loves us. Anyways. The teachings of the bible are funny, histercal, graphic, insightful, profound, sad, hopeful, etc. I know its not possible to prove and have 100% evidence. I don’t think there is anything that could happen to me that would have me doubt that (as i shudder in and hide in a corner). If you look at the bible alone. It has great teachings, it is molded together to intricately. Just by reading it you’d have to start believing again even if you were told God didn’t exist. And so the cycle continues of some people from belief to disbelief. Hence i guess the importance of needing to continually being in Gods word. I think that science is one of the most amazing tools given to us by God – but just like any other tool, it can be misused by us humans. Just when we think we know “everything,” we discover the next layer, and then the next, and then the next, ad infinitum. I think it was the turn of the 19th century when the head of the U.S. Patent Office said “Everything that can be invented has been invented.” Bottom line is we’re humans, and we get things wrong all the time. Even with science on our side, we are playing a probability game and trying to be as accurate as possible. But as every scientist will tell you, nothing is 100% certain. We can increase the number of significant digits (90% becomes 99% becomes 99.9% becomes 99.99% and so on) but we can never hit 100%. So let’s just say that we have the best science possible. We have the most “evidence” possible. Every i is dotted and every t is crossed, and things look bullet-proof. It’s still not 100%. And if there’s one thing in the entire universe that can beat 99.99999999999%, that can be the 1 in a quintillion… I’d put my money on God. I saw this report on the Today show this morning and my stomach churned. On the heels of the DaVinci Code, it’s seems really “trendy” for the media to come up with these conspiracy theories. I REALLY don’t appreciate the incinuation that JUDAS is the son of Jesus and Mary Magdalene. As for your question, the resurrection of Jesus is what my entire faith rests on. To find “undeniable” evidence that contradicts that would 1) be nearly impossible by human means, and 2) would invalidate the scriptures- therefore making all of the Judeo-Christian belief system void. Unfortunately, it is POSSIBLE for the world to be “duped”- we saw it with “Lucy” and the evolutionary “missing links” and we’ll see it again with the rise of the antichrist.